Irene takes her readers back to Hope Harbor in her latest book, "Sea Rose Lane," and I enjoyed this return trip. Eric is returning home after a change in his life and hoping to figure things out; however his home is not the same as his father is converting it into a bed and breakfast. BJ is in charge of the renovations and Eric and her so exactly click at first. BJ is dealing with things from her past and Hope Harbor may just be the place where both of these individuals need to be at this time. Hope Harbor is such a cute town that has really become like a real place to me in Irene's books. It is a town filled with wonderful people and I love how she weaves in multiple characters and their stories into the books. This is a sweet story of healing and love and moving on, but also one that just has such a homey feel to still and a picture of small town life that will leave you longing to be a part of the town and a part of these characters' lives. "All Summer Long" is the latest read from Melody Carlson and it is THE perfect summer read! Tia has been working in the family restaurant with her uncle until suddenly her aunt calls from San Francisco with an offer Tia jumps at. Tia is so excited at the prospect of helping get a new business going and being a chef on a yacht, so many wonderful times to come she is sure. When Tia arrives, she is met at the airport by Leo, a man whom she met years earlier as a teenager, and with whom she shared a kiss. Tia is shocked when she learns that Leo is engaged, and just became engaged that very day. I really enjoyed this book, it is a nice blend of adventure, and romance in a beautiful city by the water. It is a light and fun read, but has a lot of heart. I love the strong bond that Tia has with her extended family and the love they share for cooking. This is a must read for fans of Melody and if you are new to Melody's books this is a great one to start with this summer! If you are looking for a book to read that is full of heart and a story that will completely draw you in and hold you captive, then "Jilted" is for you! However, I would highly recommend you read the first two books in the series first just because they are THAT good and the characters will become even more so real to you. Varina is a talented writer as she has the ability to create characters and storylines that are so easy to relate to and her descriptions are so detailed and written in a way that I became a part of the story. Lynda has struggled with heartache, depression and thoughts of just feeling trapped, yet not willing to actually leave her hometown and start over. Described as a half-empty girl, she is consumed with negativity and tired of pretending. However, Lynda has determined that she is going to try and not hide within herself and move on with her life. This book portrays life in a small town and how things can be both difficult and wonderful when everyone knows each other and their pasts. This is an emotional read and I found myself tearing up at times and smiling at other times. I highly recommend the Mended Heart series for a hopeful and inspiring read that will completely captivate you. 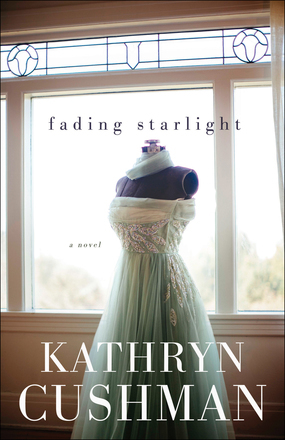 I absolutely loved Kathryn Cushman's latest novel, "Fading Starlight." Kathryn takes the reader into the world of Hollywood, and the betrayal and secrets, including a mystery that has been unsolved for decades. Lauren's career has been destroyed in one moment as a young star has a wardrobe malfunction while wearing one of her dresses. Forced to do anything and everything she can at this time, she packs up and moves into a home that needs a lot of TLC and takes on the task of designing and making costumes for a high school production. Lauren's new neighborhood is beautiful and gated, with a suspicious and secretive neighbor across the road who is determined to uncover Lauren's true nature, making life even more interesting and even more difficult. I loved how this storyline progressed and the character development. Lauren is a main character whom was so easy to connect with and root for as she was a compassionate person and did her best to make the right choices when faced with difficult decisions to be made, mainly pressure from Kendall. At first of course it was difficult to really like Charlotte, but it was obvious she was covering up hurt and pain and really was living a lonely life. The descriptions of Charlotte's dresses and accessories were amazing, as were the descriptions of Lauren's creations; I could picture them all so well in my mind. I loved that Lauren and Charlotte shared the same fashion sense and their love for the clothing of that era and dressing for dinner and tea. The story is inspiring and I love how Kathryn wove in Biblical truths throughout the story through Lauren's friends and her interactions with others. "June" written by Miranda Beverly-Whittemore is a powerful, dramatic and engaging story that covers years and generations. Cassie is struggling to come to terms with her grandmother June's death and she is living in June's mansion that has seen better days. Cassie is overwhelmed at the thought of fixing up the mansion and in general the thought of life and what she is should be doing with her life. However, one day an incessant noise which turns out to be the doorbell completely changes her life and has her wondering who her family actually is and what happened in this town so many years ago. MIranda does an incredible job with jumping back and forth between present day and decades earlier when Hollywood came to town and June was on the brink of marriage. I was completely engrossed in this story from the very beginning, and just wanted to keep reading to find out the full story. The characters were all so real and also the mansion and rooms had so many stories to share as well. I could completely picture this town, this home and the individuals living there, and loved how their lives intertwined. I highly recommend this book for an engaging read this summer. "Dwelling Places - words to live in every season" by Lucinda Secrest McDowell is just what I needed at this time. The book is divided by season and it begins with Fall and the word "dwell." I wholeheartedly agree that I tend to dwell, tend to live, but not really have my focus and dwell where and how I ought to as I find myself rushing to another task and having an endless to-do list. Each two page reading focuses on one word, just one! I love that as it really helps me to be mindful on the reading and on that specific encouragement for the day. Life is busy all the time, but it a different kind of busyness depending on the season and time or year; therefore I love that Lucinda has divided the readings by season, specifically tailored to that type of typical busyness for each season. This book is also the perfect size to tuck into a purse or to leave beside the bed so you can pick it up and read first thing in the morning, last thing at night or whenever you have a free few minutes. We've all had the feeling that something's not quite right with our lives. It's bigger than any specific failure or disappointment. It's bigger than any person. No matter what you achieve or how much you drink or sleep, you can't shake it. It haunts you---night and day---and propels you to do something. So you build. You build and build the maze that is your exhausting life. Sound vaguely familiar? The Seed: A True Myth is a journey into the personal labyrinths we create to protect ourselves and those we love from the pain of living in a broken world. Guzman's "true myth" takes the reader on an unforgettable journey that is, in essence, the grand narrative of God's redemptive work in the world. This page-turning Christian fantasy tale is packed with mystery and drama, and readers will feel the weight and power of redemption as they journey alongside Guzman's characters in their epic battle. The Seed deftly communicates the heart of Trinitarian theology through story---without using theological language or Christian terms---and reinforces biblical themes such as God's character and man's true identity and calling. Erik Guzman is Vice President of Communications and Executive Producer at Key Life Network. He's the cohost of the nationally syndicated talk show Steve Brown, Etc. and announcer for "Key Life." His writing has been featured in Key Life's magazine and online at KeyLife.org, Liberate.org, Burnside Writers Collective, and Sojourners (sojo.net). He is also a Lay Eucharistic Minister, a drummer, and a 5th degree black belt in Aikido. Erik, his wife, and three children live near Orlando, Florida. "The Seed" is an interesting read by Erik Guzman and one that really made me think a lot throughout the book. Guzman has been compared to C.S. Lewis as far as the writing style and type of story and I completely agree. I was not sure what to expect with this book, but I thoroughly enjoyed it. I was immediately drawn into the story and I loved how it was written. I was able to become completely immersed I the story and draw parallels with my own life and my relationship with God. This is a deep read, but don't let that push you away as it is a great summer read that will take you on a journey to truth and how God redeems each of us. Not any one of us lives a perfect life and we may be living with regrets from the pasts and looking ahead with apprehension to the future and wondering what if's. Yet throughout life and in each moment God is right there guiding us if we let him take control. Series Page on Goodreads: here! her very own real-life hero, their four wonderful children, an adorable grandbaby, and a yappy Yorkie named Bella. Deputy Jill Fla herty sat at her desk wrapping her brother's birthday present for his surprise party tonight. The yellow helium balloons she'd ordered were currently bouncing in front of her face. She lifted her hand to bat them way, ripping the paper off the present in the process. A present that she'd been painstakingly wrapping for the last ten minutes. Frustrated, she swore under her breath while shaking her fingers to free them of the tape and brightly-colored tissue paper. Will a leap of faith and an act of courage turn into a new life? Kristy Cambron is a must-read author for me and her books are must-haves for my shelves. Kristy's latest, "The Ringmaster's Wife," is fabulous - the cover, the storyline, the characters, the history, everything about it! I loved the two main characters, Mable and Rosamund, and the paths that they chose and how Kristy wove their stories together. Mable sets out to see what the Chicago World's Fair has to offer and her life is completely changes as she meets John Ringling. I found the circus life aspect of the story fascinating and the 1920's has always been a time period I have loved ready and learning about, everything from the historical events to the society life to the fashion. These details and aspects of life all become so real n the book and I love how the story and the history comes together. I am already anxiously waiting for another book from Kristy! *To read other reviews included on this blog tour, go here! And if our hidden agendas aren't enough, we wear masks to obscure the truth even more. We put on these masks---like religion, appearance, power, politics, or protection---to drive our agendas. But all of this leaves us feeling phony, ashamed, guilty, and afraid. It's killing us and hurting those we love. But for most of us, it will be a cold day in a hot place before we will be fully honest with anyone else. Steve Brown is a radio broadcaster, author, and the founder of Key Life Network. A former pastor, he also sits on the board of Harvest USA and devotes much of his time to the radio broadcasts "Key Life" and "Steve Brown, Etc." "Hidden Agenda: (dropping the masks that keep us apart)," by Steve Brown is an eye-opener read that is so honest and so fresh that it will keep you turning the pages and leave you thinking about it long after you close the book. In the very first chapter, Steve shares when he had an emotional breakdown and made some major changes in his life. He states that he was alone in his office with no one to encourage, no one to impress, and no one to convince; this really stuck out to me and has stuck with me. I thought about a typical day of mine and how much of that day I am hidden behind a mask because I feel like I have to encourage someone or convince them of something or impress them by how many things I can get done or how many things I can balance. The important thing is how I feel behind these masks, how these masks are affecting me. I really like the self-reflection questions at the end of the chapters and also the tips for small groups reading through this book together. I think this would be an excellent choice for a small group to work through together, but it is also a great choice to read on your own as well. I was constantly reminded throughout this book that God can see the real me behind my masks and also to make me mindful of my true agendas. *Thanks to the Litfuse Publicity Group for including me on this blog tour and for the complimentary copy of this book in exchange for a honest review." Eddie Sherlin and Bill Ligon grew up on opposite sides of the tracks in Gallatin, Tennessee. They knew the barriers that divided them--some physical landmarks and some hidden in the heart--but those barriers melted away when the boys were on the basketball court. After years of playing wherever they could find a hoop, Eddie and Bill rose as leaders of their respective high school teams. And at the end of the 1970 season, all-white Gallatin High and all-black Union High faced each other in a once-in-a-lifetime championship game. What happened that night would challenge Eddie and Bill--and transform their town. A fast-paced true story of courage, determination, and forgiveness, More Than Rivals offers hope and inspiration for our times. 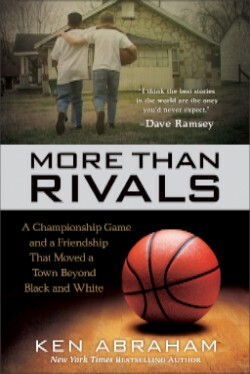 "More Than Rivals" is such an inspiring, feel-good read! I was immediately drawn into the story and transported back in time to life in the south in the midst of segregation and tension. Ken Abraham does a great job with creating the backdrop of the story; he really brings the societal views, politics and everyday life in general to life making it so real to the reader. Also, the story transitions back and forth "across the tracks" offering views of life from both sides and I like the way that this was done. The friendship that these boys and their love of basketball is such a nice, inspiring story and one that will have each of the readers thinking about and being inspired by for a long time. For more information visit his website at http://www.ashleyprenticenorton.com and connect with her on Facebook. "If You Left" is a complex read, but at the same time is the perfect summery, beach read. Althea has struggled with mental illness for most of her marriage and she ponders the fact that her husband has stuck by her side and why he has done this. Althea is trying to put forth effort with their adopted daughter and just effort into her life in general, but then she is faced with the realization that it might be too late and also that it might not be what is the best for her. I enjoyed Ashley's style of writing as the story just flowed so nicely, but also it was so easy to become a part of the characters' lives. I liked how the conversations were written, but also what Althea was thinking was shared as well. Althea couldn't become more real to me, as honestly how many of our thoughts are held in and not spoken aloud; this allowed me to really connect with Althea as I was hearing her, but also knowing what she was thinking. I liked Oliver's character in the beginning of the book, but as the story went along, I grew less and less fond of him. Clem's character was created and portrayed so nicely and I enjoyed her interactions with Althea, even though some made me cringe as I hurt for them and their lack of a bond. Yet, this made me feel even more connected to the characters and invested in the story. An added side note - this book is for a mature audience, as there is vulgar language and explicit intimate scenes. Also, the issues that are addressed are geared for more adults as well. Lily's happily ever after barely survives the honeymoon, and she faces the toughest choice ever. "My Father's House" is a multi-layered read that will stay with you long after you finish the book. This is Rose Chandler Johnson's latest book and it is filled with heart, romance and suspense. Lily Rose grew up with her father and his love and when he passed away her world was changed. Lily struggled with her mother's mental health issues and her detachment from Lily's life. Lily's bond with her father was the one thing that grounded her in life and she thought she had found what she needed when she got married. However, the honeymoon bliss was over quite quickly. This book addresses quite a few issues that are sometimes just glossed over and not really discussed or addressed as they can be uncomfortable. Rose explores these issues in Lily Rose's life and how she must decide what is best for herself. Rose writes in such a way that the reader is immediately drawn into the story and into the characters' lives. I love how the characters' strengths are highlighted and the roles they play in Lily's life. I highly recommend this read. 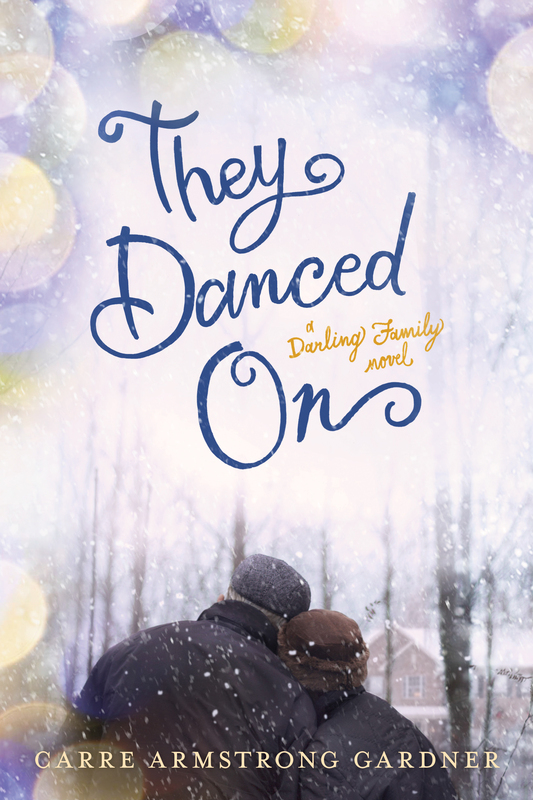 "They Danced On" is the third book in the Darling Family saga by Carre Armstrong Gardner and it draws the readers back in the lives of this beloved family. Jane and Leander are the pillars of the family and after Leander is diagnosed with a debilitating illness, the family struggles to come to terms with this, in particular Jane. This book focused on the subject of faith and the struggle of having faith, but yet still bad things happen. I have enjoyed all of the books in this series, mostly because the characters are all so real and easy to relate to as they struggle with things that all of us deal with in our lives, and things are not just fixed and dealt with nicely, just like real-life. Carre does a nice job with developing the storyline and also bringing the reader up to speed on all of the characters' lives. The writing is so descriptive as well that it felt as if I was a part of the story. I highly recommend this book as it focuses on family life, and issues and situations that are faced in everyday life. Carre Armstrong Gardner is a former worker with children at risk in Russia. Now she lives in Portland, Maine with her husband and three teenagers, where she writes books and works as a nurse. Visit her at carregardner.com. Life doesn’t always go as expected for the characters in your book (and for us in real life). What are some ways you’ve learned to respond when this happens? Living and working in Russia was a great training ground for this: life hardly ever went as expected there, both in small ways and big. There were constant curve balls; lots of disappointments and also wonderful, unexpected surprises. I learned to roll with it; I had to, in order to save my sanity. When I came back to the States, a pastor friend said, "Wow, Carre, you’re so much less uptight than you used to be!" How’s that for a back-handed compliment? But I took it in the spirit it was intended. I think there are a couple of keys to how to handle life not going as we expected. The first is to get your own expectations out of the way from the start: expectations that you’re going to get what you deserve; that your kids are going to turn out well; that other people are going to live the way they should live. Disappointed expectations are the root of all bitterness. In fact, we are promised very little by God: we are owed even less. When our expectations are low, it clears the way for gratitude. And gratitude is the second key: it has the power to change our outlook on everything. Paul’s injunction to give thanks in everything means that sometimes we have to give thanks even when we don’t understand a situation; even when there seems nothing to be thankful for. It can be a real discipline. Like all disciplines, the gratitude muscle should be exercised during the less-than-dire times. Then, in times of crisis when we need to call on it, the habit will be there. What is next for you, writing-wise? I’m working on a young adult series. Sort of a futuristic mix of sci-fi and fantasy. Very different from the Darlings! I’d like it to be an allegory of the Gospel for people who would not read the Gospel otherwise. And I’m working on some short stories.